Recently I switched out my Specialized Ground Control tires for a set of 45NRTH Dillinger 5’s. The Dillinger is what I think of as a “do-anything” fat tire. At 4.6” it’s fat enough to float through all but the deepest snow. With its knobby, aggressive tread it’s designed to give you confidence around a snowy berm or on slick, off camber groom. Its custom studdable capability allows for shredding in those sketchy, shoulder season conditions. For my maiden voyage on these new meats I took them to the top of our local “big mountain.” At the base of Crow Peak (4,100 ft) the snow was melting on the trail, creating a mix of frozen mud and ice. I was pleasantly surprised at how stable the tires felt as I climbed up wet rocks in usually un-sendable conditions. As I gained elevation, the water started to freeze solid, making the trail more of an ice-skating rink than singletrack. My tires aren’t studded yet, but I still felt good maneuvering on the ice. Not 100%, but good enough. By the summit (5,700 feet) the Dillinger’s were in three inches of snow—and they were loving it. That is, after all, what they were designed to do. They floated through the deep sections yet still gave me traction on the rocky surface below. While these tires are on the heavy side, in my opinion their versatility and capability makes up for the added weight. 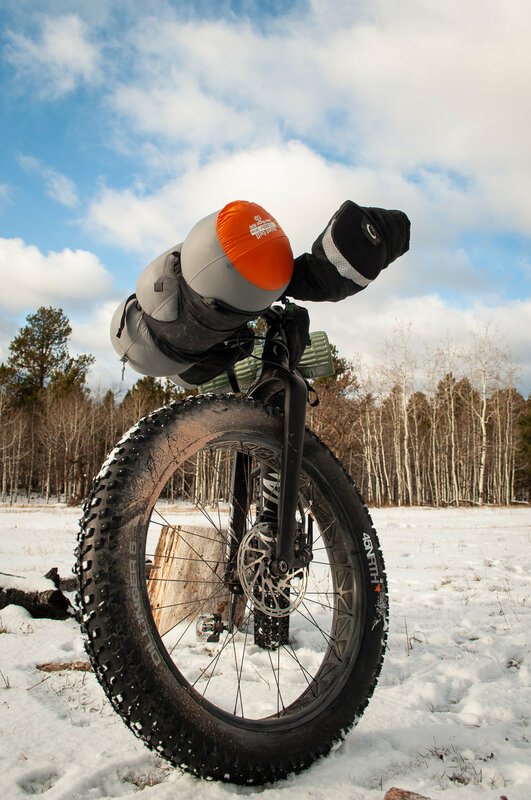 If you want to ride your rig in every season, in every condition, this might be the tire for you. I recommend the custom studdable version. It will save you some cash (the custom studdable tires sell for around $140 per tire, while the studded sell for $220 a tire), and studding your own tires is absolutely doable (and sort of fun). Go to your local shop and purchase some studs and a stud tool, like below. If your tires are still in the box go ahead and seat them to your rims (or have your local shop do it for you). Once you get home and are ready to stud, make sure to get your tires wet with soapy water. This will make the studs go in soooo much easier. Then, insert the base of the stud into the stud tool and with a side to side motion, insert the stud into the tire. It’ll take a few studs to get the hang of it, but as long as the rubber on your tire is wet they should go in pretty easy. I don’t recommend filling in every stud hole. From my experience it’s unnecessary for most conditions, and will make your tires insanely heavy. Ask your local shop if they have a favorite pattern or play around a little with it! The last set I helped stud were stud heavy on the outside of the tread (for better traction while turning) and less so on the inside. Final step: Go shred with confidence, you stud, you!